We would like to reveal you one of the biggest secrets of the house. We will share with you a secret recipe of tomato chutney, that will taste so good, that you won’t be able to eat tomatoes in any other form anymore! This chutney has a tangy, mildly spicy and slightly sweet flavour. 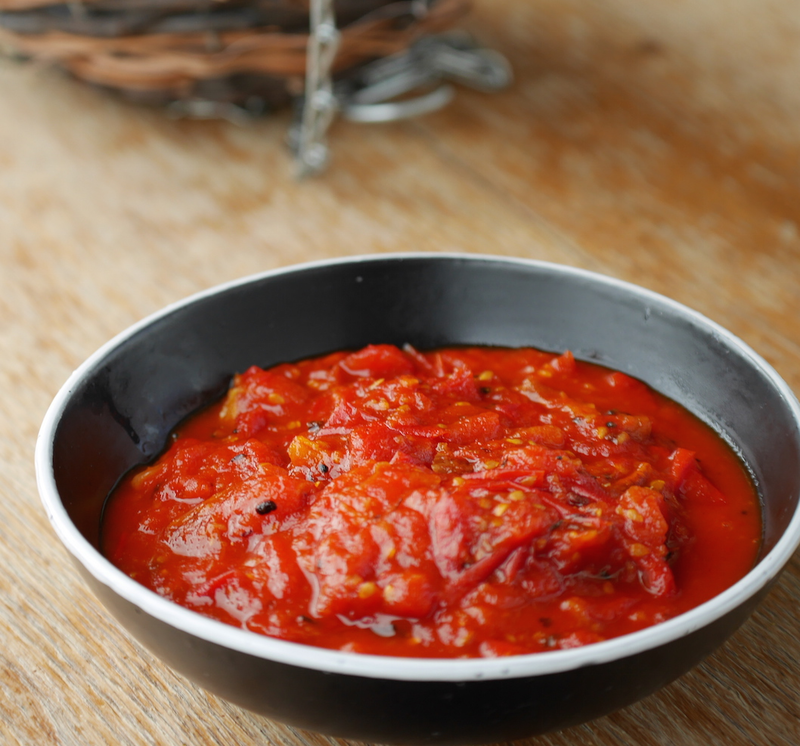 You can use it as tomato sauce with pasta or rice, as a spread on bread or crackers, or as a dip with your favourite vegetables. It matches wonderfully with almost everything and has a very complex, but yet satisfying tastes combination. You can store your tomato chutney for a few days in the fridge, but we doubt it will last beyond one evening – yes, it is that good! Step 1. Heat oil of choice in a pan. You can use any vegetable oil, except for coconut oil, as it can give a strong aroma. We recommend to use ghee / purified butter. Step 2. Add mustard seeds, fennel and bay leaf to the pan and fry them slightly until mustard seeds begin to crackle. Step 3. Add grated ginger and mix with spices. Step 4. Add tomatoes, steer and cook for about 10 minutes, until tomatoes become soft and pulpy. Step 5. Add chop dates, sweetener (jaggery), chilli powder and salt. Cooke for another 5 minutes. Your delicious chutney is ready! You can store it in a glass jar in the fridge and enjoy for up to four days. And if you want to learn more why you should have tomatoes in your diet, check out this article about science-backed health benefits of tomatoes.